Are you still looking for a better way to secure your urinary catheter bag to your leg so that it doesn’t slide down or put dangerous and uncomfortable pulling pressure on your tube? Well, the CUBU, or “Comfy Urine Bag Underwear” may be just the thing for you. I was lucky enough to get one and try it out. I liked it a lot! So what does it do? Well first, lets talk about the need for securing a catheter bag to your leg. If you are stuck with a urinary catheter and you are also are lucky enough to be ambulatory, then you need a way to carry a urinary bag around with you in a way that is convenient and that doesn’t show. So the leg bag was invented. It goes under your pants as you go about your day. As the bag fills up, the stretchy bands just cannot really take the weight. So the bag starts sliding down your leg. This pulls on the tube(s). The bag can then come unconnected from the catheter tube, causing you to leak all over your clothes and/or – this happened to me – all over he floor of your friend’s living room. Most bags do nothing to secure the actual catheter tube to your leg. So you need a second product like a Grip-Lok sticker to do that. Failure to lock down that catheter tube can put you in serious danger of yanking on that tube, which goes up your urethra and into your bladder. You do NOT want risk suddenly and violently pulling that out. Fortunately, most leg bag tubes connect to the end of the catheter tube in such a way that any hard pulling will simply pop the tubes apart (see above for the consequences of that). But even then, an unsecured catheter tube can cause some serious pain when pulled on. This is one of the new methods. And there is only one product I’m aware of that does it, called Freedom Belt . It has a lot of promise, but is still ramping up in the manufacturing stage. So there are not sufficient supplies (as of Oct 2018) for everyone who wants one yet. But the idea is awesome. It’s a sturdy belt, as the name implies. And there are straps attached to the belt that hang down. You simply attach your bag to the belt, which then hangs securely. It ain’t going anywhere. 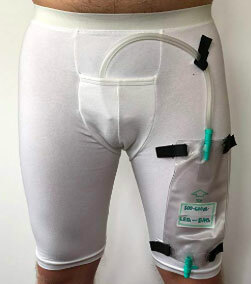 Though it would depend on what kind of pants you’re wearing, you might not need a Grip-Lok to stick down the catheter tube when wearing a Freedom Belt. But it might now be a bad idea for extra security and comfort if you are wearing, say, gym shorts – which you CAN do with Freedom Belt. The Comfy Urine Bag Underwear is pretty much what it sounds like – comfortable underpants. But unlike regular underpants, the CUBUs are stretchy and extend from above your waist down to just above the knee – essentially like a long pair of bicycle shorts. There is an opening in the crotch for the catheter tube to come out of and attach to the bag. The key element to the CUBU is the set of velcro straps already sewn into the left leg of the shorts. There is one to secure the leg bag tube above the bag, and then there are four (two on each side) that perfectly align with at least one common leg bag – the McKesson bag. As far as I’m concerned, this is the best possible way to wear a urinary leg bag. First of all, it’s much more secure than using the traditional strap method. Since the undies are so secure already, and the bag is then attached firmly to those undies, the bag isn’t going to be pulling down against the tube. And even if it did pull a little, the strap holding the top of the tube is there for good measure. Also, because of the design, you probably would never need to ALSO wear a Grip-Lok type sticker to hold down the catheter tube. Everything is held close and secure with the CUBU. I put the CUBU on and attached a McKesson leg bag about 3/4 filled with water to simulate the weight of the bag under typical conditions. I then put on the same pants I used to wear with my own leg bags when I had my catheter – a pair of long drawstring fleece pants. The big question I was trying to answer here – besides how secure and truly “comfy” it is – was how easily I could empty it into a toilet. I tried two different ways and both worked well. First, I just pulled the loose pant leg up above my knee, exposing the bottom of the bag. that made it easy to aim the outlet valve into the toilet no problem. The other way I tried was just to pull the pants down. Of course that works too. You will want to be in a stall with a door for this. But that was always the case with any method. I HIGHLY recommend getting a couple pairs of CUBUs. They come in multiple sizes and in black or white. I don’t know why someone didn’t come up with this idea – and make it available to everyone – before now. If these had been around when I was living my “year of the catheters,” there is no question I would have used CUBUs. 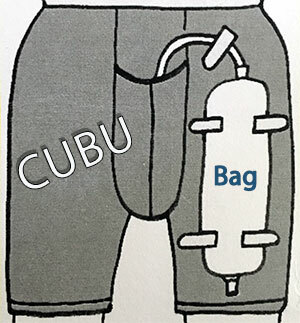 NOTE: CUBU is compatible with leg bags that have 4 slots/holes in them to thread the CUBU’s straps through. It will not work with bags (like Hollister brand) that have “buttons” on them instead of slots. CLICK HERE to check them out and order yourself a CUBU or two.